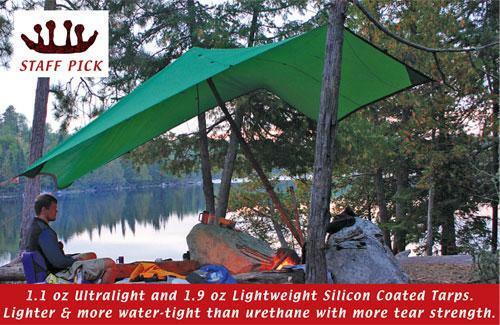 Don't trust your camp to anything less than a BWCA Tarp made in Minnesota! Our dependable Boundary Waters Tarps are the best available for canoe country travel. They have withstood rocks, rain, wind, tree branches, and all the abuse our staff can dish out. They're constructed of coated ripstop nylon with a reinforced packcloth center square, and nylon tape binding on all edges. 3/4 inch nylon webbing edges and evenly spaced loops (instead of grommets which often fail). Center quad loop and pole patch. Made in Minnesota to outlast all others. Tarp packs down small! Includes 80 feet of polyester 450# test 1/8 inch rope, stuff sack, and McNett SilNet. a must have! Before our trip to the Boundary Waters, we played with several tarps, none of which we were delighted with. So we decided to rent one of these and see how we liked it. We didn't like it, we LOVED it. So much so that we bought one to have with us all the time. 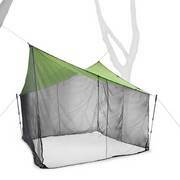 We use it for all our outdoor adventures. There are lots of ways to use it (lots of loops [not grommets] around and across) and it's light and quiet! Does a great job keeping your equipment dry. One of the best things we've purchased!